We are currently accepting applications to add to our Waitlist. Applications are available on-site in the laundry room & a packet can also be mailed to you. Return completed applications to the laundry room Office mailbox located next to the washer. 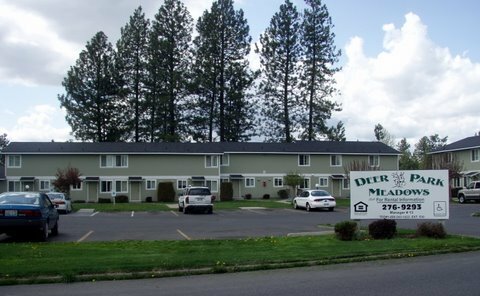 You can mail applications to 15 N. Weber Rd #13, Deer Park, WA 99006. Thank you for considering our low-income housing property. 14 out of 15 units offer USDA Rental Assistance to receive subsidized rent (rent is approximately 30% of all income). One non subsidized unit will accept a Section 8 or housing voucher for this unit only. Restrictions on student applications. Tenants must be over 18 years old. One, two and three bedroom units in a multi-family housing complex. Walking distance to elementary, middle & high schools. Bus pickup by apartments for elementary & middle school only. Across street from mini mart & gas station, 8 blocks from local grocery store, library, city pool and post office. Two blocks from city park and golf course. On site coin-op laundry facilities. Deer Park Meadows pays for all tenants' water, sewer and trash. Tenants pay for electricity & may choose to purchase internet & cable service. Office Hours: Tues - Thurs 10:00 a.m.- 2:00 p.m. & by appointment please. Deer Park Meadows pay for all tenants' water, sewer and trash. Each Unit has a built-in outside storage shed. We have a small play area with a basketball court. When you are notified of an upcoming vacancy an $18.00 screening fee is due at that time. Money Orders are currently accepted for this.